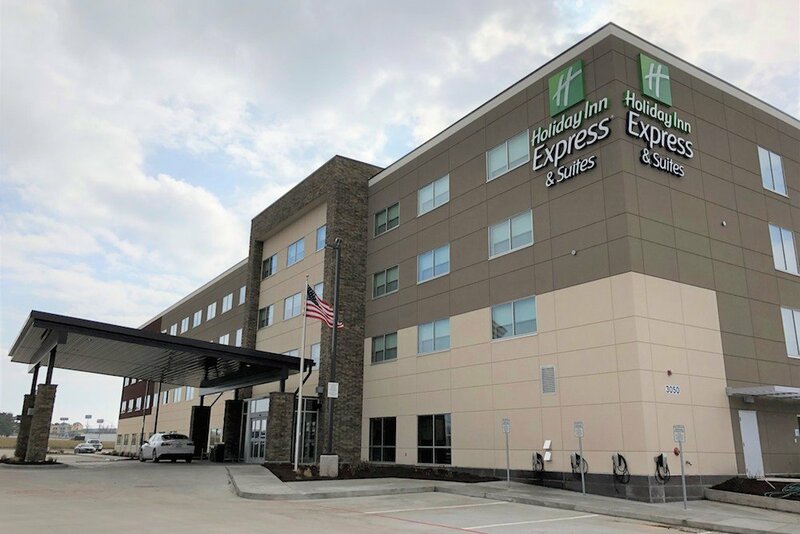 O’Reilly Hospitality Management LLC opened its new Holiday Inn Express & Suites and adjacent Moon Town Crossing event center in north Springfield. Kevin Algeo, general manager for the 111-room hotel at 3050 N. Kentwood Ave., said the lodging facility opened to customers Feb. 1 after the completion of the $13 million, nearly 63,000-square-foot project he said started about a year ago. Moon Town Crossing, located at 3070 N. Kentwood Ave., held its first event — a monthly open house — on Jan. 13 as construction continues at the craftsman-style event space, said Cassidy Palmer, the venue’s sales and operations manager. For Moon Town, wooden beams for the barn-like structure were made at Ozark Timber Frame’s Amish community in El Dorado Springs and shipped to the development site in Springfield, according to past reporting. O’Reilly Hospitality CEO Tim O’Reilly’s Glen44 Investments LLC owns both properties. They’re managed by O’Reilly Hospitality. A city building permit put the estimated cost of Moon Town Crossing at $334,764, Springfield Business Journal previously reported. Larry Snyder and Co. served as general contractor with Buxton Kubik Dodd Design Collective as architect for both projects. At Holiday Inn, Algeo said six rooms were booked Friday after the hotel opened at 3:30 p.m. Four rooms were booked Saturday, with a couple others on Sunday, he said. “We weren’t in the system until we went live,” Algeo said, noting with reservations now available, he expects bookings to increase.